“It was love at first sip,” says Joey Jubran about her first taste of craft beer some five years ago. Taken not only with the beverage but the people and culture, she was determined to “be part of this amazing family.” Jubran took to the internet to research possible jobs in the industry, and stumbled upon San Diego State University’s Business of Craft Beer program. With a bachelor’s degree in business through National University, and beverage industry experience with Coca-Cola prior to marriage and raising her children, Jubran felt she was best suited to work with brewery owners on marketing and branding. Jubran answered a few questions about SDSU’s craft beer program, and her journey. What were your goals upon entering the program? My goals were simply to go and learn more about the origin and fundamentals of beer, and really be able to understand more about it beyond what I liked to drink. I also wanted to meet more people who were either in the industry or like me wanting to get into it. I was ready to go and learn and really see where it was going to take me. Which courses did you enjoy most and why? It is hard to say because the courses are unique and different and they are all great! The first class Exploring Craft Beer with Dr. Bill [Sysak] was probably the most eye-opening and intense. The amount of information and history were amazing and I couldn’t wait for more. The instructors are awesome! They’re all in the industry and well versed in the course they’re teaching. It’s great to be in a classroom learning from someone who does every day what they’re teaching to you. The amount of true knowledge was impressive. Can you speak to the networking opportunities, both with students and instructors? The networking was a huge opportunity to meet people on a personal level as well as learn from everyone in the classroom. I felt like the instructors and the program encourage students and teachers to talk and network amongst each other. This personally was the catalyst for defining my business and starting it. Being able to bounce ideas off people and engage honestly was vital for me. Hoppy Beer Gear has been a process just like everything in the craft beer industry — you can’t be afraid to try or tweak a new recipe. 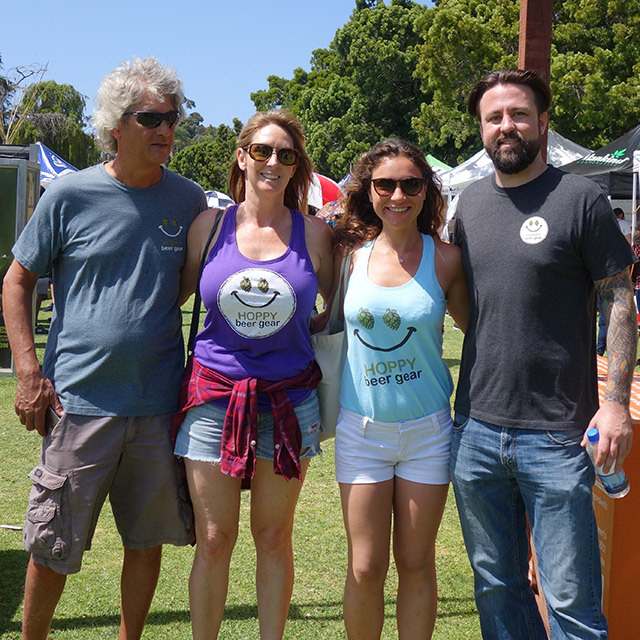 The Hoppy Beer Gear crew (L to R): Brand Ambassador Matt, Boss Lady Joey, Social Media Maven/Sales Shayna Muller, and Design Honcho Dustin Van Duzee. Tell us about your company, Hoppy Beer Gear. 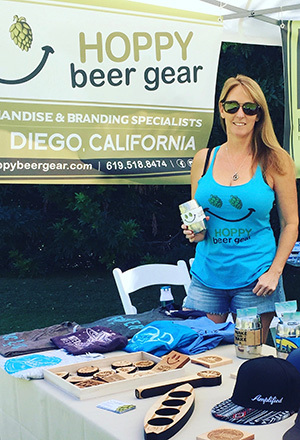 Hoppy Beer Gear is a branding and merchandise company in San Diego. We work with craft breweries on building their brand through merchandise/swag. We enjoy educating and helping breweries see the opportunity for a good revenue stream through their merchandise as well as the importance of people wearing their “brand” in a marketplace like San Diego which has a significant amount of craft breweries. Our passion is working with craft breweries on the quality, availability, and placement of apparel and “out of the box” unique swag. Keeping things fresh and new to the craft beer-loving consumer. We also assist in rebranding and design for new and existing breweries, from logo development to bottle releases and special events. Yes, we have clients in Colorado, Georgia, Pennsylvania, and upstate New York. We are growing more nationwide and it’s due to word-of-mouth or personal recommendations! Were you working while going through the program and if so, how feasible was it to balance both? Yes, I was working on the business pretty much right from the start. It is feasible to balance both. The instructors are fair but you do have a lot of studying and reading to do, yet it is very manageable and balanced. The amount of information and the amount I learned in such a short period of time. I also felt like I was able to completely build my business plan and successfully execute it with the help of the instructors and my peers. The perfect setting all around! Would you recommend the Business of Craft Beer program to others? YES, YES, I would! It’s all-around a great program with great people. It’s a good learning environment with knowledgeable and professional instructors that work in the industry. An independent businesswoman that owned her own business and loved what she did and who she worked with. I am now on that journey and absolutely love this craft family! This career came later for me, but it is truly what I was meant to do and I love being able to show my kids a true passion for work.